Lift your eyes from the Vegas Strip and behold the Mojave Desert: it wraps Sin City in a cowl of austerity, emanates from empty lots downtown, etches the edge of the suburbs with Zen-like clarity. It thrums beneath our feet. But most visitors to Las Vegas never venture into the high desert landscape, let alone revere its power. Pity. The city ringed by Mojave conserves a sacred vestige of ancient oasis at its urban core—an improbable 180 acres of one of the most expertly managed remnant ecosystems in the country. 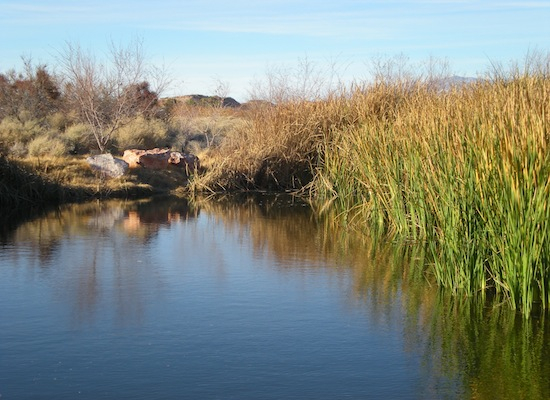 The Las Vegas Springs Preserve is an easy ten minutes from the Strip. The $250 million-plus museum campus is the genius of Lucchesi Galati, a Vegas firm renowned for its use of recycled materials at a time when Clark County’s green building codes linger in infancy. Who would have thought that a parking structure sandwiched between a 20-million gallon reservoir and 2200 solar panels could elicit gasps of beauty? The patina on the earthen rotunda recalls the yummy chocolate layer cakes of youth. In keeping with Vegas’ crowd-pleasing imperative, the Springs Preserve, I discovered, has everything you need to be happy—bring the whole family (state-of-the-art playground)! Or your lover (benches under cottonwood trees). My earth-first friends applaud the message of ecology and sustainability delivered through the Desert Living Center, interactive history museum and botanical gardens. The fit crowd will appreciate the nearly two miles of trails. Bobcats live out there. At the heart of the Springs Preserve is the “Big Springs” that gave the spot its name. Scholars disagree as to when the first human dipped a toe into the stream, but University of Nevada – Las Vegas’ legendary archaeologist, Claude Warren, found intriguing evidence of domesticity dating to at least 2000 BC. A single chipped rock scraper can speak volumes about the hairy hands that held it. The case for the Anasazi, who occupied the site about 1300 years ago, is even more substantial. Eventually, the “Big Springs” hosted the Pueblo Peoples, Patayan and Numa before passing into the calloused palms of pioneers and eventually into the care of the widowed beauty, Helen Stewart. The Bugsy Siegel visionary of her day, Ms. Stewart established the first Vegas resort, an enterprise featuring pool, food, lodging, supplies and Pony Express mail service. Las Vegas, it seems, has always been a tourist destination. Today, all that’s left of the “Big Springs” is an unremarkable hump on the desert floor. Formed from sediment hauled to the surface when the waters still flowed, the mound offers a rare vantage point on the Springs Preserve and its cheek-by-jowl relationship with the city. Just beyond the gray-fox habitat, customers scout parking places at Trader Joe’s, and not far away from yellow butterfly nursery, The Stratosphere tower soars, Jetson-like, toward the sky. The desert from which the neon came, and the desert beyond its faintest glow, is always underfoot and in our field of vision. It is what gives us our identity. Shining with the trillion facets of a single mirror, it reflects the state’s history and dictates its future. What is viewed there is limited only by the imagination. Visitors who think the desert is boring haven’t looked hard enough. This entry was posted in Desert and tagged Anasazi, bobcats, Bugsy Siegel, chocolate layer cake, Clark County, Claude Warren, desert, ecosystem, Helen Stewart, history, imagination, Lucchesi Galati, mirror, Mojave, museum, nature, oasis, petroglyphs, Pony Express, Sin City, solar panels, Springs Preserve, Strip, The Stratosphere Casino, Trader Joe's, University of Nevada. Bookmark the permalink.